Alone we can do so little, together we can do a lot. 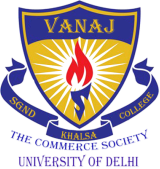 Vanaj, the Commerce Society needs volunteers for the upcoming fest 'Effulgence'. A volunteer would be involved in all activities from obtaining sponsors to organising the fest. Do volunteer and help make Effulgence a huge success.